The design resulted from the observation of "dead spaces" subjacent to stromal implants. This allows a perfect adaptation and housing of the segment in the cornea. The ring curved surface distributes the compression forces throughout a larger corneal surface, thus avoiding the creation of significant metabolic suffering and, therefore, less risk of superjacent deepithelization. 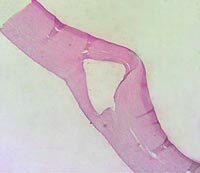 It follows the corneal lamellae, which are also bent at the site of the segments implantation (as the cornea is curved, not straight). As these segments are at an 80% deep implanted, there are a higher number of lamellae to absorb compression in their anterior face. It helps segment involvement by the corneal lamellae. The ring has a 4.7 mm inner diameter, higher than the 4.4 mm of the traditional triangular segments (14% increase). Resulting from the ring major biocompatibility, it thus eases the postoperative contact lenses fitting. A healthy epithelium also provides a more regular and better optical quality corneal surface. The Visiontech Assistance provides support to training and medical consulting services.